Before you read the rest of the article, answer this question. Do you think students who use admission agents to admission in USA are academically unprepared? Now, you have an answer set in your mind, lets look at findings from a recent research report published by WES. Researchers at WES surveyed over 1,600 prospective international students from 115 countries, from October 2011 through March 2012. So, whats the outcome of the survey? Information on English proficiency and other criteria was used to categorize high or low levels of academic preparedness. Students with high and low financial resources were identified based on expected institutional financial aid to be available to them. Then based on the survey data, U.S.-bound international students were assigned to one of following 4 segments. Strivers: High academic preparedness; low financial resources (30% of all respondents). Strugglers: Low academic preparedness; low financial resources (21%). 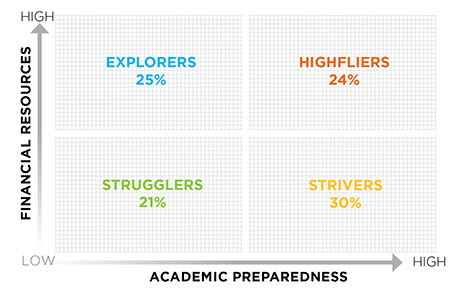 Explorers: Low academic preparedness; high financial resources (25%). Highfliers: High academic preparedness; high financial resources (24%). Report discuses about ways students get information about U.S. Schools. Here is an interesting section of the report – Use of Agents to get admission in USA. Only 16% of all respondents reported to having used an agent. “Strugglers” were found to be particularly likely to use services such as essay, resume or personal statement editing. 63% prepared for admissions interviews with the help of agents (only 34% of “Strivers” did so). As you can see, students who are using agents fall under Strugglers category. Several folks reading HSB should be using agents to apply for college admission in USA. Do you agree that you are Academically under prepared? In general even if you are not using agents, what do you think about this research report? Which segment do you fall under? According to above report, only 16% of applicants used agents. When so many others students can get admission, visa successfully without agents and they do spend lot money and taking the same risk. So, the question is why do you think that 16% are not willing to take that risk? What are they feeling insecure about this admission process? can visa officer find out whether i have really appeared for sat? Hi raghu,I scored 317 in gre V-156 Q 161 🙁 … did some silly mistakes in quant…will post my experience later..
Good score. Get started with your SOP. Can you send me an email. You maybe able to help me with something. 1. 7,25,000 students go USA for higher education EVERY YEAR, assessing just 1.600 students for a survey to arrive at conclusion is highly unfair. 1. Genuine students having nothing to hide-want to get accepted by best suitable university. 2. Average students, overly-optimistic (due to unclear facts and inadequate info about entire admission process) expecting some miracle to happen. 3. Fake students who want to sneak into US anyhow through some dubious means. 4. Busy students (best or average ones) who dont have time to spend on entire admission process since they are highly busy in their academia or a full time job, who wanna hire an agent to delegate him entire process. NOTE: Academic preparation per se has not a major role to play in most of the cases as admission process is more focussed on standardized tests, affordability, rankings, location etc. i.e. “non academic” factors. So i feel you should omit the word “Academic” from your topic title. This Survey categorizes students into 4 categories but NOT the agents. There are different types of Agents and there are different types of students. 1. UNBIASED-HONEST: Non university affiliated unbiased agents, those depend entirely on the fee they charge to a student, do their best to get into best possible university, have own set of statistics. 2. UNBIASED-DISHONEST: Non affiliated con agents who wanna somehow place an ignorant student in any university and earn the fees. 4. AFFILIATED-BIASED: Single University sponsored agents biased to attract pool of students to that particular university. Now the permutation-&combination of above types between agents and students give rise to a new outcome that needs to be analysed for survey. NOTE: surveys should not override one’s intuition and understandings arrived at after taking into the account various factors based upon his / her own research. Best approach is be self reliant, collect info from many sources, make your own formula and apply. Its not as tough as it sounds actually. Its fairly easy. We are just applying for a course on different continent not a different planet! Akshay – US Presidential elections are in November. Poll that comes out comparing President Obama vs Governor Romney that came out yesterday was done by CNN to show ROmney gained 1 point. The CNN poll was conducted by ORC International August 31-September 3, with 1,005 adults nationwide, including 877 registered voters and 735 likely voters, questioned by telephone. The survey’s overall sampling error is plus or minus three percentage points, with a sampling error of plus or minus 3.5 percentage points for registered and likely voter questions. National level poll done to predict US presidential standings was done with just 1005 adults. Typically all the major poll are similar. i agree. But few years back i had this book called “American Surveys (or US surveys): Myths, mysteries and false promises.” its some 500+ pages book, with samples from some of popular surveys. if you could find it, do read it. It tells how surveys wrongfully influence individual’s decisions and how they are conducted with pre determined background. It is worth reading. 1) Agents help in finding universities for students (good, medium or worst) but they will help you in getting a sureshot I-20. Many students are not willing to do research on their own even though all information is on web. 2)Agents help in arranging letter of recommendation, statement of purpose, payment of application fees etc. 3) Agents provide fake financial documents on the basis of little commission. They even transfer money into your account for some time. 4) There is a sudden rise in US university representatives visiting India and participating in educational fairs which are in collaboration with some recruiters/agents. As US economy goes down, they are making an effort to recruit more foreign students to earn more money. 5) Some educational agents are working in tandem with desi consultancies. there are some scams like asking students to transfer to fake universities like tri-valley after one semester in genuine university or working illegally after getting CPT in first semester etc. I personally advise students to avoid wasting money in agents. all the info is on web, HSB is there for all the required information. SOP, LOR is not a big deal and fake financial documents will not help you either. Although it is an analysis from an institute, I tend not to believe it. Reason? personal experience.Why? please read below my story. I have completed my MSc from one of the reputed University of UK (in my subject) in September 2011. I am working in IT since September 2011 in UK itself.In May 2012 I have joined another company which is a very large multinational organisation. I have work visa to work in UK till 2014 but I have always intentions to pursue my PhD in the same field of IT I am in (and no disrespect to other IT field but it is one of the best exciting field of IT now for career,both industry and academia) so I have started applying towards various universities in EU,US and Canada. Now, how can I cope up with the job and the long process of application at the same time? it is really not possible due to time factor. For example, one university asked me to submit my transcripts (original copies or certified copies). I can do that for my MSc transcripts but what about my BTech from India? I am still in the UK.So I have to go for verified copies. Now who can verify? the university demanded it should be at least a Justice of Peace (JP) or a member of University register. Now I emailed to one of the members of my postgrad University but she said that she can’t verify my BTech ones.Arrgghh!! what can I do? I went back to my prospective PhD university and they suggested if you can’t find a JP, get the documents to an authorised agent in London. Voila, seems like a good and easy solution to me, since these agent won’t charge you a cent.So I went to an agent and gave all my documents to them to process and send. I did not use an educational agent when I applied for my MSc in UK, although I was working as well after my BTech when I applied for my MSc. Applying for PhD and working simultaneously is a whole lot different ball game and applying in US/Canada is not as simple as applying to UK/EU universities. So, at the end of the day I believe I am not academically unprepared and of course all the students are not same. ONE THING HSB!!! it says 16% have reported that they are using agents services!!!!! “reported” implies dey have … lets say “confessed” but its not guaranteed that every participant is telling the truth,because at least from India people tend to portray them as “Self-sufficient”?!?!?!!!! I’m planning to apply for Fall ’13 for MS in Computer Science. I have already given my GRE and TOEFL. All that’s left to do is to shortlist universities and apply. I know it’s not so difficult if you are focused. However, considering that this is a big decision with a huge investment involved, both monetarily and otherwise, I’m planning to seek help from foreign education consultancy. I think my decision to do so is justified. Hi Suyash. I would suggest that whomever you consult is certified with one of the counseling organizations in the US (such as the National Association for College Admissions Counseling or the Higher Education Consultant Association). Also, I would not accept advice from anyone unless they have a verified track record of paving the way for students to succeed at solid schools. Best of luck! I think this is true to a lot of extent. Considering the kind if profile the univ usually look, its not very difficult for “academically prepared” students to make a decent application, like getting LOR’s, and SOP’s, and those students dont find it hard to write an honest statement of purpose. On the other hand agencies usually help underprepared students to get a “sureshot I20” ( as they say it), because underprepared students probably lack otherwise a decent chance, and they know that too. I personally thnk, i am academically underprepared, but want to be completely prepared on my own account, hence do not want to use agencies, who take advantage of the mere fact, that there are so many univ in US, and everyone will more or less get somewhere or the other. On a related point, colleges and universities are becoming more vigilant than ever against certain agencies and college counseling outfits that engage in unethical practices to get their students in the door (e.g., writing the student’s admission application essay for them). Even Ivy League schools (though they are loathe to admit it) have been burned when they admit someone who looks like a future Nobel laureate on paper… and that student turns out to be someone radically different on arrival. Worst of all, these students may be set up for failure if they are chronically under-prepared.